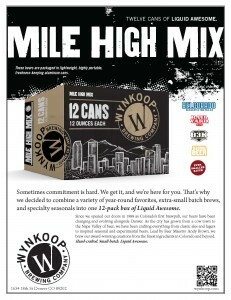 We have been very busy expanding our outside distribution and getting more of our beers into cans, and now we are excited to announce the addition of a 12-pack box to our Wynkoop line-up. The Mile High Mix Pack will feature the favorites Railyard Amber Ale, B3K Black Lager, Belgorado Belgian-style IPA, as well as rotating seasonals and selections from our Even-Smaller Batch collection. In short, 12 cans of Liquid Awesome.